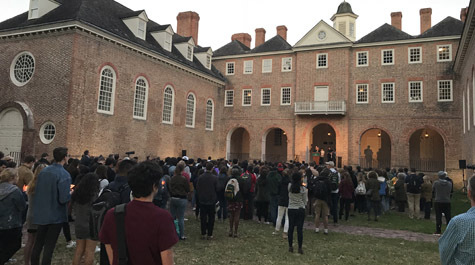 Candles flickering in their hands, dozens of faculty, staff, students and community members stood in solemn silence outside of the Wren Building Monday night as eleven names were read. Bernice Simon, Sylvan Simon, Melvin Wax, Daniel Stein, Irving Younger, Rose Mallinger, Jerry Rabinowitz, Joyce Feinberg, Richard Gottfried, Cecil Rosenthal, David Rosenthal: all killed by a gunman in an act of hate and anti-Semitism in a Pittsburgh synagogue Saturday. Rabbi Gershon Litt, director of Hillel, said that although anti-Semitism is nothing new, this generation has now experienced the worst single act of anti-Semitism in American history. For those wondering what action can be taken, Litt said to commit to performing acts of kindness in memory of those who were killed. “Before we leave this ceremony today, let us think about that commitment. Let us make a commitment to ourselves so we can move forward and bring back into the world what these people represented,” he said. “My friends, I believe that this, this is our weapon. This is our ammunition that we can deploy right now against bigotry, against violence, and against hatred – that is kindness to others. 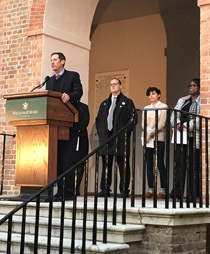 Max Blalock, campus minister for the Wesley Foundation, spoke on behalf of Campus Ministers United, saying that they stand together in unity with the Jewish community. “And we say, enough. We say, no more,” he said. “But sadly … unless things change, there will be more acts like this because people are being targeted by hate. When we stand together, the most radical thing we can do in such an environment like this is embody love and kindness toward everyone, especially those who in our group or our community people want to push to the margins. Alexina Haefner ’19, the president of Hillel, said she wants the Jewish community to feel safe and protected. “I want this community on campus to feel like a tallit that you can wrap around yourselves when you need support or lift over your head for protection,” Haefner said. “If you need support, know that you community is here for you and that I am here for you, know that you are part of a vast global community that has shown resilience through centuries of oppression and that we will survive and thrive for centuries more. 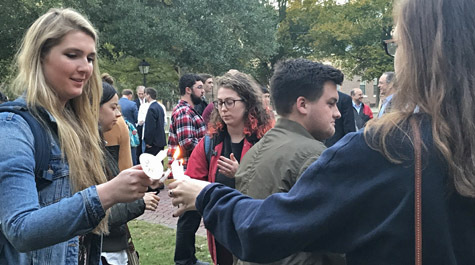 Members of the W&M community held a candlelight vigil in remembrance of persons killed at a Pittsburgh synagogue on Oct. 27.